Autumn is right around the corner, so that means the weather will be getting cooler, the days shorter and the holidays fast approaching. It’s time to start thinking about transitioning our home decor from Summer to Fall. When it comes to a change of season, I like to easily slide into the next season’s decor without a big fuss. The exception to that rule..is Christmas. I save the heaving lifting for Christmas time and go all out…with multiple trees and a sprinkle of Christmas everywhere and anywhere I can find in our home! Today, I am sharing a few tips on how I make the transition into Autumn an easy one. For the most part, we now have a neutral decor throughout our home. But it hasn’t always been that way. Having owned several homes prior to this one, I have been all over the place with decor! Ranging from very formal to country, I have tried just about everything! And I have come to realize that decor can’t be lumped into one category. I like certain aspects of certain styles. My home is a combination of modern traditional, modern french country, industrial, and contemporary. I think most of us would describe our style as a combination of styles. As much as I love the beautiful colors of the Fall season like burnt orange, yellow and browns, I found that maintaining a neutral color palette makes the change super easy. How wonderful to be able to keep our Spring and Summer decor to use in the Fall season! First, I decide which rooms and areas of my home I want to focus my Fall decorating. Do I want to redecorate an entire room or just add a sprinkle of Fall decor? Maybe a couple pillows and a throw would suffice, or maybe I want to decorate a mantle and add a wreath? Before I go out and buy a bunch of new Fall decor, I rummage the garage and other rooms in my home to see what I have that can be used this year. These blush pillows were purchased in the Springtime from Home Goods HERE. They have been in my family room since Spring and will stay throughout the Fall season. By bringing in a couple other neutral Fall elements like a pink pumpkin, I can incorporate the pillows into our Fall decor. The only new items I purchased this year are the 2 pumpkins for my coffee table. I found them at Home Goods. I searched my house for other “coffee table” items and brought them into the mix. Neutral fillers like creams and gold can hang around all year long, add a couple candles for a no fuss display. Trays are versatile and can be used any time of the year for just about anything. I have a collection of trays around the house and intermingle them throughout the seasons. Adding more vase filler to a glass container, maintains the neutral decor and ties in with the coffee table decor. I also brought in my preserved boxwood topiaries HERE that can be used all year long for a variety of different looks. This room was an easy, no fuss transition with just a sprinkle of Fall decor. By keeping my existing elements and adding a pink pumpkin, the family room is ready for the season. For more Fall decorating ideas, check out this post HERE. How do you decorate for Fall? Do you go all out or add just a sprinkle? 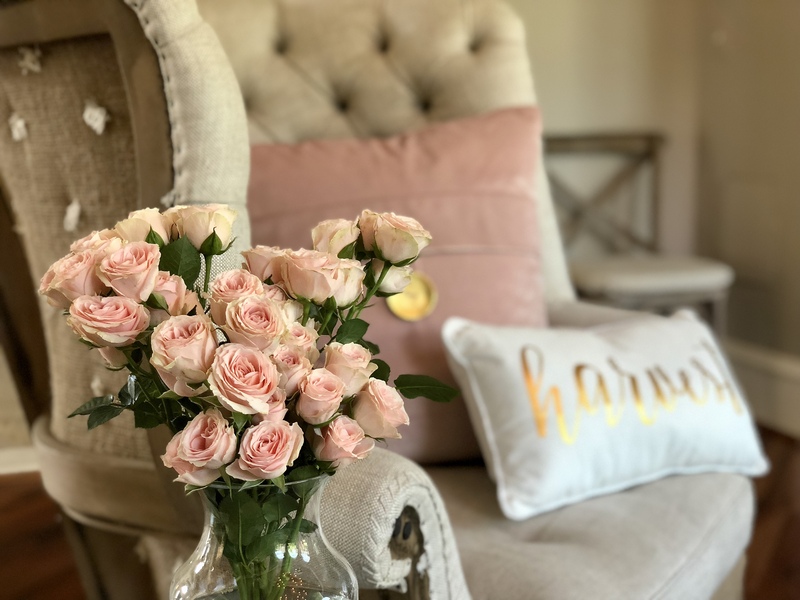 For more posts about seasonal decor, subscribe to Happy Haute Home and follow along on Pintrest HERE, and Twitter HERE and feel free to pin and tweet your favorite pics from Happy Haute Home. Those are very pretty fall arrangements! Great job!